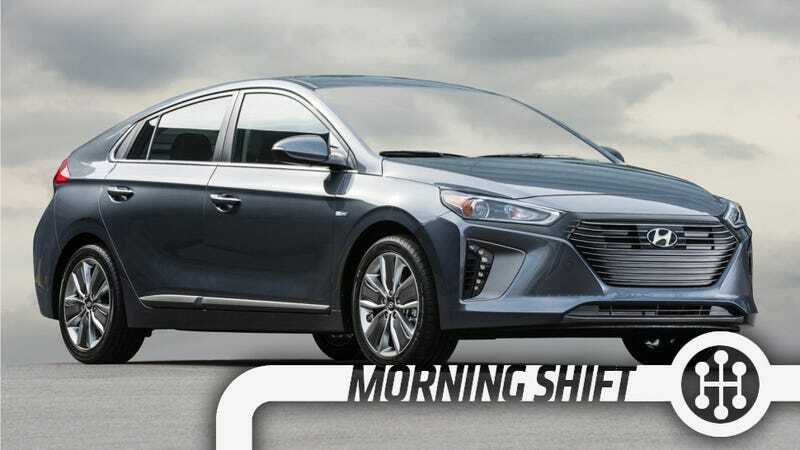 Hyundai Motor said it plans to launch an electric vehicle with a driving range of about 200 miles per charge in 2018, aiming to better compete with other electric car makers such as Tesla Motors Inc.
Hyundai just came out with the Ioniq, which is mostly a hybrid like a Toyota Prius, but also has the option of being delivered as a half-assed electric car with only 118 miles of range. 118 miles, 200 miles, doesn’t matter if you can’t take it out of the city. 2nd Gear: There Might Be A Volkswagen Up! GTI! Volkswagen has fast-tracked plans to raise the image and overall sales appeal of its entry-level Up through the addition of a new range-topping GTI model, according to officials at its engineering headquarters in Braunschweig, Germany. The secret new GTI model, which could be priced from £15,000 in the UK, has been conceived to provide Volkswagen with a sporty rival to the popular Abarth 500 (now 595). It will use a powered-up version of the company’s newly introduced turbocharged 1.0-litre three-cylinder petrol engine in a brand-building exercise under the motto ‘affordable performance’. Make it happen. Give it to us. Please. Now. Please. Now. Please. Now. Sales of cars, trucks and SUVs fell 6 percent last month, to 1.54 million, according to AutoData Corp. It was the biggest monthly drop in nearly six years. The decline was unusual for May, a month when Americans typically buy cars ahead of summer road trips. Most major automakers reported lower sales. General Motors’ sales fell 18 percent, Ford’s slipped 6 percent and Toyota’s sales dropped 10 percent compared with the same month a year ago. Volkswagen’s sales sank 17 percent. Fiat Chrysler and Subaru bucked the trend, with sales up 1 percent each, and Hyundai’s sales jumped 12 percent. Volkswagen’s woes are probably at least partially attributable to the ongoing fallout from dieselgate, but sales of the Chevrolet Silverado pickup truck alone are down 13 percent. 4th Gear: But Maybe It’s Not The End Of The World? Automakers sold more than 1.53 million new cars and trucks in May, a volume of vehicles that the industry could only dream about a few years ago. The drop in May sales occurred in part because a quirk in the calendar gave dealers two fewer traditional selling days compared with May 2015. We’ll be climbing back into our bunker, though, just to be safe. Six automakers said Thursday they are recalling nearly 2.5 million U.S. vehicles with defective Takata air bag inflators, documents posted with government regulators show. These recalls include 1.9 million SUVs and trucks from General Motors Co, along with the recall of 217,000 vehicles from Volkswagen AG (VOWG_p.DE), 200,000 from Daimler AG’s Mercedes-Benz USA unit, 92,000 from BMW AG, 54,000 from Jaguar Land Rover, a Tata Motors Ltd brand, and 5,100 from Daimler Vans USA. More than 16 million vehicles have already been recalled. Expect that number to rapidly approach infinity before this month is over. The 32-year-old race car driver Bruce McLaren dies in a crash while testing an experimental car of his own design at a track in Goodwood, England on this day in 1970. Neutral: Who Will Be The First To Get That Electric Cars Need Fast Charging Stations? Besides Tesla, of course. Because it’s not going to work otherwise.